Have you been struggling with an annoying ringing, buzzing, or whistling sound in your ears? Even though you’re the only one hearing these sounds, you’re not alone, and many people experience tinnitus. Tinnitus is common, affecting around 1 in 5 adults, and about half of all seniors. Tinnitus often goes hand in hand with other conditions, such as age-related hearing loss, or noise induced hearing loss. Tinnitus can also be caused by any illness, injury, or infection that affects the ears. Even a build up of earwax can create tinnitus. Tinnitus is caused by cell damage, either in the ear, in the auditory pathway, or in the auditory centers in your brain. Tinnitus and hearing loss often go hand in hand. In fact, 90% of the time, those with tinnitus also have hearing loss, so we recommend treating hearing loss and tinnitus together. Hearing aids of today do far more than amplify sounds, and amazing programs help you focus on speech sounds, identify where sounds are coming from, hear in places with a lot of background noise, and even treat tinnitus! 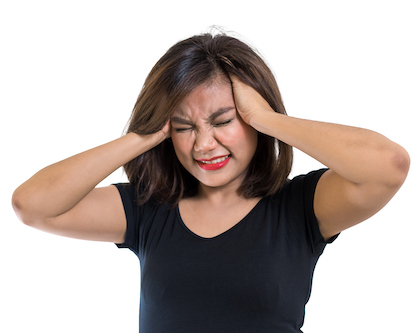 You might not think that tinnitus is a big deal, but living with untreated tinnitus can cause a lot more issues that you realize. When you first experience tinnitus is might not affect you very much. It may be present as a slight annoyance, and come and go at random. For some, tinnitus can disrupt every moment of their day, making it difficult to concentrate at work, communicate effectively with loved ones, and even interfere with getting a good night’s sleep. During the day you might not notice tinnitus, since there are many other sounds in your environment for your ears to focus on. But in the silence of the night, you may find it impossible to drift off to sleep. Poor sleep leads to a host of problems, including fatigue, stress, anxiety, irritability, problems with memory, and depression. Your mood will be affected, you’ll struggle to concentrate, and both your professional and private life will suffer. Sadly, there isn’t a cure for tinnitus. Once your ears have been damaged, there’s no way to regenerate these cells, and you’ll have to learn to manage both your hearing loss and your tinnitus. However, there are very effective treatments for tinnitus, the most common of which is sound therapy. Advanced tinnitus therapy programs are usually sound therapy programs, designed to reduce or mask your tinnitus, allowing you to communicate easily, focus on tasks, and get a good night’s sleep. If you’ve ever used a white noise machine, turned on a noisy fan, or slept with a dehumidifier that created a constant hum, you have an idea of how sound therapy works. We’ll work with you to perfectly attune the settings of your tinnitus management program, and you’ll be able to use white noise, pink noise, nature sounds, water sounds, or even your favorite music, to mask your tinnitus and allow you to get on with your day. These programs can easily be controlled using a smartphone app, so you can adjust the settings whenever you need to, and make sure your tinnitus stays in the background. To learn more about tinnitus, how it’s affecting your life, and what your treatment options are, visit us today at Pacific Hearing Care, and our team of hearing health specialists will help you find the perfect treatment plan for both your hearing loss and tinnitus.